What a week! The heat keeps on coming and surface water temperatures in the Itasca area are firmly established in the upper 70’s and even into the low 80 degree range on a few of the darker water lakes. Even though the heat has worked to slow down the Walleye action in many of the area’s better lakes, fishing opportunities for Smallmouth Bass, Largemouth Bass, Panfish and Muskies is probably as good as it can get! Bluegill lakes all around the Grand Rapids area continue to produce both quantity and quality fish. I expect that as long as the water temperatures remain warm and the weather stays relatively stable, these scrappy fish will continue to bite. We’ve had a great time with them this week and discovered that every lake has had a little different twist when it comes to choosing the best baits and presentations. On a few of the lakes where both Bluegills and Walleye are present, my favorite approach has been to use live bait rigs tipped with large Leeches on the deeper weed edges. The larger leeches are attractive to the best Sunfish and it’s really helped to cut down on the little fish. Keep on rigging those weed edges and it’s just a matter of time before you’ll find a school of Walleyes to keep the trip interesting. Bluegill lakes that don’t have great deep water weed edges force us to get up into the heavier weed cover. Then I switch the fishing style over to a small 1/16-ounce jig head tipped with a cut piece of night crawler, small worm or leech. There’s a little searching to do before we find the better schools of ‘Gills, but if we move slowly through the weed beds and fish vertically, we’ll find pockets or clear spots in the weeds. These small harder bottom areas have been the best spots for better schools of fish and it’s been well worth the search. More than once this week, we’ve been able to locate fish using the live bait and then switch to small plastic baits. My favorites this week has been a small plastic crawfish and tiny 2-inch plastic worm fished on a 1/16-ounce jig head. Bass fishing for both Largemouth and Smallmouth can’t get any better than it’s been. With the warm water, the Largemouth Bass seem to have gone on a full time feeding frenzy and if I’ve ever seen better action, I can’t remember when it happened. The deep weed patterns are always my favorite and that’s been the key to success throughout the last month. I always like a six inch plastic worm fished on a jig head, this summer I’ve come up with a new twist on the jig heads that really works great. The lightweight "slow fall" jigs (by Jigs ‘n ‘ Rigs) are Non Toxic and weigh about half of what the standard lead heads used to weigh. So now you can fish a larger hook and bulkier profile bait without plowing to the bottom. My favorite has been a six-inch Lizard on a "slow fall" jig with a 1/0 hook. The Bass are really tearing up that combination. 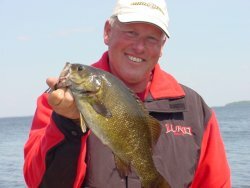 Smallmouth Bass have been just as active, but deeper points containing rock, gravel or clam beds have been better producers. Fishing deeper structure has been better with live bait rigs tipped with Jumbo Leeches or lively minnows leading the way. A six-inch Creek Chubb or even an extra large Golden Shiner on a live bait rig really gets their attention. Try not to feed line, just let them snuggle up a bit and then set the hook. Waiting too long will result in fish swallowing the bait. Then you run the risk of damaging the fish before you can release it. 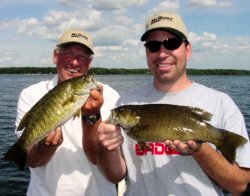 Early and late in the day, Smallmouth can be caught too by casting a jig worm combination up onto the shallow flats adjacent to these deeper points. Work the bait down the drop with a twitching motion and hold on to the rod! 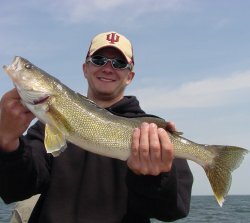 The better Walleye fishing action has become centered around Weedline and shallow structure on a lot of the area’s better known lakes. 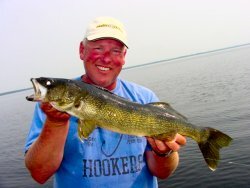 But there are some exceptions and one tip I’ll pass along is to look for opportunities on some of the deep water, clear lakes that have decent Walleye populations. You know the ones, lakes with a reputation for being "night lakes" or known as tough to fish. At a time when the best Walleye lakes have been fished hard, there are several lakes that receive much less pressure and don’t really turn on until the water gets warm. You might have to stay out and fish the evening bite on these clear water lakes, but the best fishing of the season is happening now while the water temperatures are keep those fish active. Deeper points and main lake humps in the 20 to 40 foot ranges are the best daytime or early evening locations. You’ll find that it’s fairly easy to see fish on your electronics, rigging with leeches or vertical jigging has been the best way to go. I’ve tried rigging with crawlers, but between the Sunfish and small Perch, it’s awful hard to keep a crawler intact long enough to attract a Walleye. On the more traditional Walleye lakes in the area, there are enough fish going on the "crankbait bite" to make it worth taking a look at. Fish the outside edges of the weedline with a number 5 Shad Rap, Husky Jerk or RattleTrap. I like to keep my speed around 2.5 MPH or so. Sometimes a bit faster or slower, depending on the depth and weed cover. Fishing the same weedlines with live bait rigs and spinners will also produce some fish right now, particularly if you get a decent drifting wind. Perch fishing has greatly improved especially on Big Winnie and we’ve had some great catches of the true mid summer jumbos and even magnums this week. It’s been slow to come this year, but the deeper fish are showing up on not only the mid depth flats, but on the lakes deeper bars and humps. At times we’ve had to work an area fairly hard to get them started, with the first few fish coming in slow and sluggish. But once we get the ball rolling, the bite keeps picking up as fish in the area jump on the bandwagon. It’s been fun to watch the screen on my Lowrance fill up with fish as they gather around some of these deeper humps. I really like a simple jig head tipped with a minnow for catching these fish. Once you get a school started, fish vertically hovering about the fish or just barely moving around them. Usually you’ll get an hour or so on the better spots. If the bite fizzles out, move on to greener pastures. With early signs of a summer fish kill looming, Tulibees, Suckers and other cool water fish have moved onto the shallower mid depth flats. Larger Pike and Musky have started following their preferred baitfish into the shallows and action has started picking up. Reports of several Muskies caught this week on Winnie and Cutfoot Sioux tend to make me think that we’re on the verge of my next happy time of summer, where casting for Pike and Muskies leads us into the fall bite. 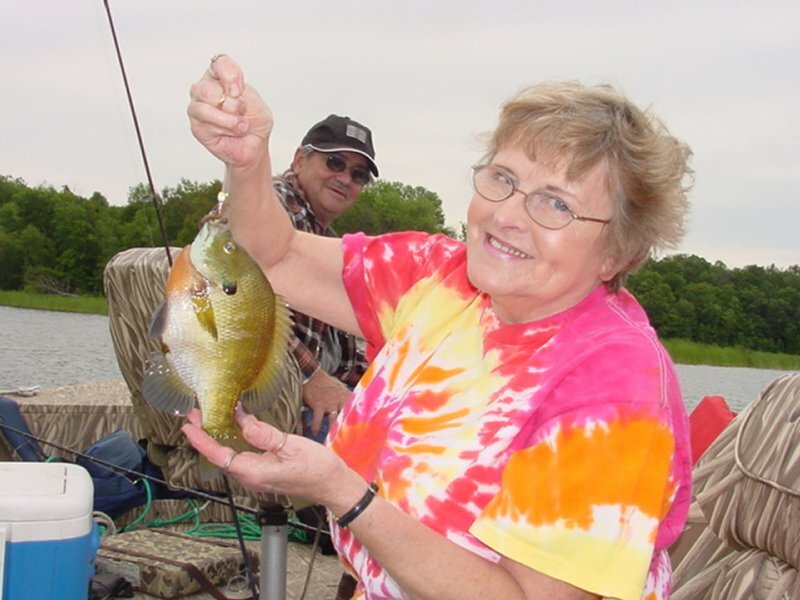 Grand Rapids, Deer River and the Itasca area have been blessed with several days of great summer weather and the fishing for Bluegills, Perch and Bass has really heated up. After a heat wave last weekend that threatened to make wimps out of even the toughest anglers in the region, a cool down delivered relief from the heat and sparked an enthusiastic response from the fish. For folks like me who enjoy the "action bite", this is prime time to load up the family and get out on the lakes while the weather is perfect. The water temperatures are at or near the highest they will ever reach for the season. Some area lakes have surface temperatures well above 80 right now and even the coolest waters are consistently showing temps in the mid to high 70 degree range. Bluegills have been the highlight of the week as they are on what I’d call a ravenous bite right now. These scrappy fish seem to be everywhere and I’ve seen lots of good quality size fish in the past several days. The size of the fish varies from lake to lake, so your own research and experience is going to dictate where you look for them. But, on virtually every lake I’ve been on, the pattern is the same. Look for the same structures you would fish for Walleyes like deep weedlines points, gravel/rock bars and sunken islands with weed cover on top. This has led to many mixed bag catches that included Walleye, Bluegills and Bass all on the same structures. The fish have been most active on the deepest edges of the cover, so we’ve caught many of them on live bait rigs tipped with leeches while we’ve been fishing for Walleyes. 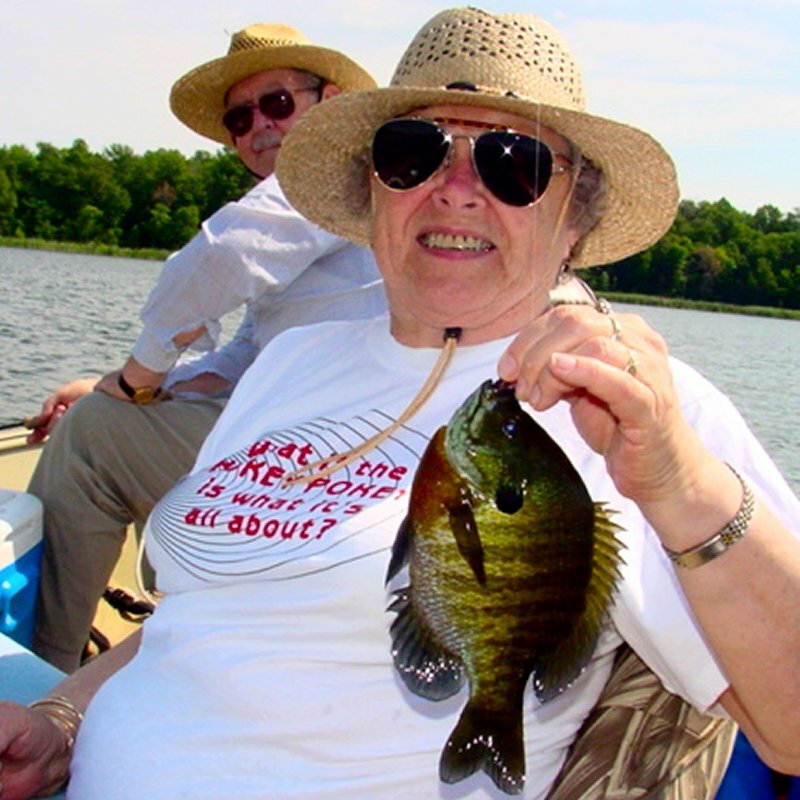 The larger the leeches, the larger the bluegills so stop at the bait shop and get a good supply. Once we’ve located a school of better fish, we’ve switched over to a 1/16-ounce jig and a small cut piece of worm or night crawler. This speeds up the action and reduces the number of fish injuries from deep hooking. I don’t know how long this bite is going to last, but you owe it to yourself to pack up the kids and get out there this weekend. Walleye fishing is in the classic mid summer pattern right now. They’re biting really well at times, but with huge supplies of baitfish, insect larvae and other treats, the fishing has its ups and downs. One thing I’ve noticed this week is that the fish are in a slightly different location every day. I’ve had to coach myself to keep looking in new areas and I’ve had to forget about some of the "good spots I fished yesterday". I really think that there’s enough food in the lakes right now to keep the Walleyes satisfied 24 hours a day, so the best bet is to keep searching until you find yourself in the midst of a school that happens to be feeding now. You’ll find lots of fish on your Lowrance, but if you can’t get the walleyes in that school to bite, move on to another spot. It might seem like a lot of work, but there is almost always a place where you can get them going if you keep after them. 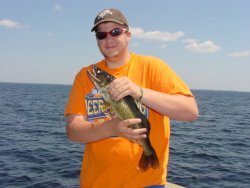 Once you find the Walleyes, the best baits are still Leeches and Night Crawlers fished on either a live bait rig with a five to six foot leader. Adding a spinner to the live bait rig is simple and it seems to be just the ticket at times when you find active fish. One thing to remember at this time of year, is that the warm water can really get the fish moving and it’s possible to miss fishing opportunities by moving too slowly and using an aggressive approach like spinners or crankbaits moved quickly through a school of fish can sometimes trigger more hits than using the classic slow presentations we rely on most of the season. Weedline Bass action is at its best right now and like the Bluegill fishing, warm water has triggered a hot bite. We’ve had good action on a variety of soft plastic baits. A couple of great producers have been soft plastic Crawfish imitators and standard six-inch plastic worms. The fish have been plenty aggressive so the jig head with an exposed hook is perfect. Cast toward the weed edges, let the bait fall, give it a twitch or two and hold on! Perch fishing is finally getting into high gear and fish that have been absent for the past six weeks are showing up in good numbers on rocky/gravel flats, rock humps and on deeper open water humps and bars. There are an ample supply of keepers and even a few borderline "magnums" to sweeten the pot. We’ve caught quite a few Perch on Leeches while we’ve fished for Walleyes, but switching over to a jig and minnow combination has been a better way to catch numbers of fish. There are enough reliable spots holding Perch now that the search for a good school won’t take long. 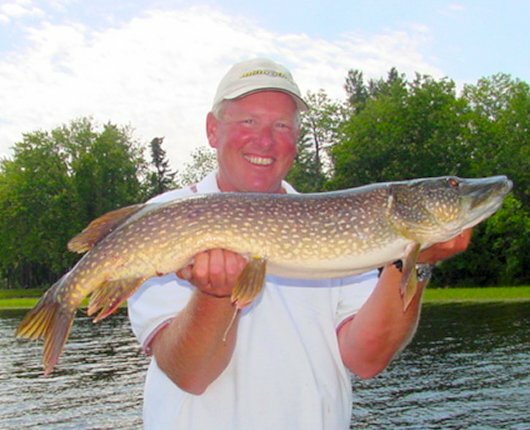 Larger Northern Pike continue to use open water, but there are some early signs of movement back into the shallows. With increased Algae blooms, higher water temperatures and depleted Oxygen levels in main lake areas, habitat in the shallows starts slowly filling up. First the baitfish arrive, then the Pike and Musky. There are already some average size Northern Pike using the deeper and/or heavier weed edges and I’d expect to see the numbers increasing during the next week or two. For now, fishing these weedlines with deeper running baits is your best bet. Jigs rigged up with a short piece of heavy mono leader are good and so are live bait rigs using a 1/0 hook tipped with a six to eight in Creek Chubb, Sucker or Redtail. In some of the better weed patches, anchoring and using a slip bobber, 1/0 hook and large minnow is also a good idea. Soon, we’ll be into the casting season and big baits will work even better. But for now, stick with the live bait approach. Northern Minnesota summer weather patterns are squarely established with surface temperatures now ranging from 73 degrees¦ to 76 degrees¦ . During this mid summer, warm water period, it’s common for our better Walleye fishing lakes to have a variety of patterns going on at the same time. It’s particularly true this year because our relatively warm and stable conditions have created perfect conditions for hatching insects and producing abundant young of the year minnow and game fish hatches. With all of this "food" in our area lakes, Walleyes, Perch and Panfish are finding it easy to chow down. To get in on the best summer fishing, we have to adjust our fishing style to the conditions and look for smaller groups of active fish, move frequently and use a variety of styles. 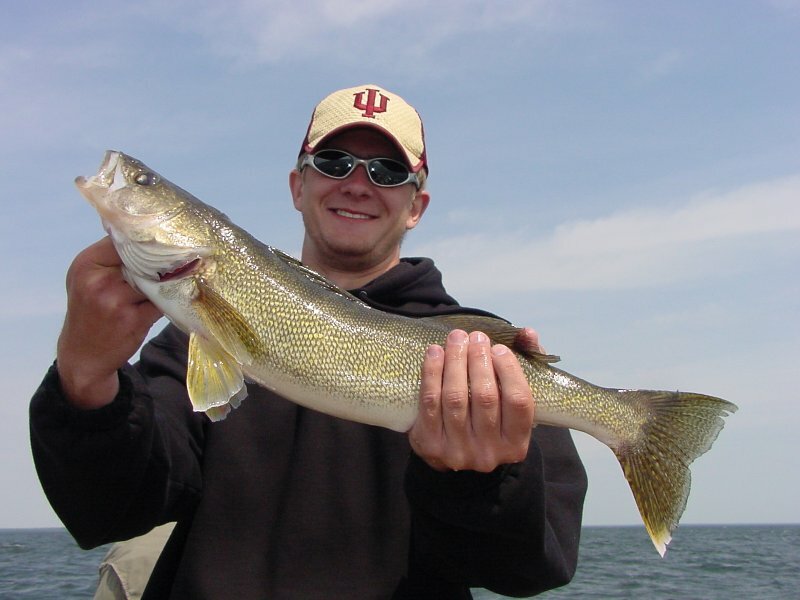 Walleye fishing remains fairly good out on mid lake bars and humps, but on several of the area’s better known Walleye lakes, these fish have been heavily pursued by anglers. For the better part of a month now there have been folks fishing on the best spots and the fish have "wised up" to a lot of our tricks. Even though these mid lake bars, reefs and sunken islands will continue to produce fish, your timing will have to be good when it comes to being at the right spot at the right time. Make frequent moves and keep a sharp eye on your electronics. We’ve had a lot of instances where we find a group of fish, catch a few of them and then "spook" the school. Once the action slows down on a spot, I think it’s best to fire up the engine and move on to another one. Occasionally, we’ll locate a better group of fish that allows us to work a spot for a bit longer and we take advantage of that opportunity, but always be ready to move at the first sign of a slow down. 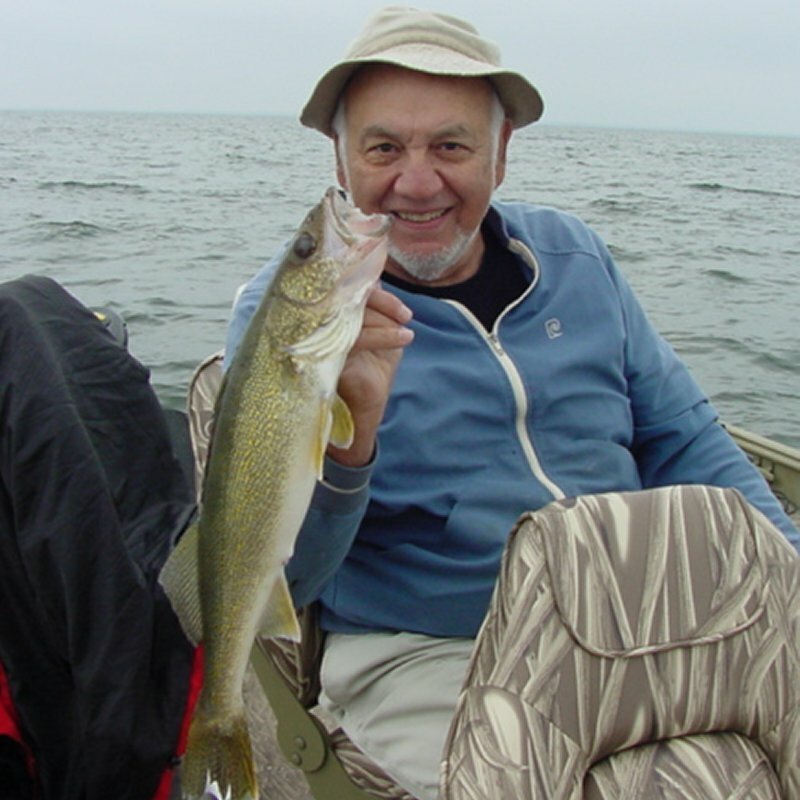 A more reliable Walleye pattern right now has been to fish the shallow water weedline. With lots of good green weeds and an excellent supply of baitfish, these weedbeds are holding decent numbers of fish and the bite has been fairly predictable for the past week or so. We’ve had our best luck fishing with Leeches and Night Crawlers. There have been a few fish caught on jig and minnow as well, but I’d classify that option as more of a mixed bag approach. If you’re interested in catching a bit of everything, the jig/minnow approach could be good. But if it’s Walleye or bust, go with the leeches and yard bait. Fish as far into the weedline as you can get away with. If you have sparse weeds with lots of open spots and holes, don’t be afraid to go right into the cover with your boat and fish slowly with your MinnKota. If the weeds are too heavy for that approach, fish as near the edge as possible and try to keep your baits within easy reach of the outside (or inside) edges of the weed growth. Water depth will vary from lake to lake because water clarity and bottom content will produce weeds at differing depths from one lake to the next. The best rule of thumb is to move your boat shallow until you find the heavier cover and then back out to edges. Once you find the depth where the weed edges occur, it’s likely to be fairly uniform everywhere on your lake. 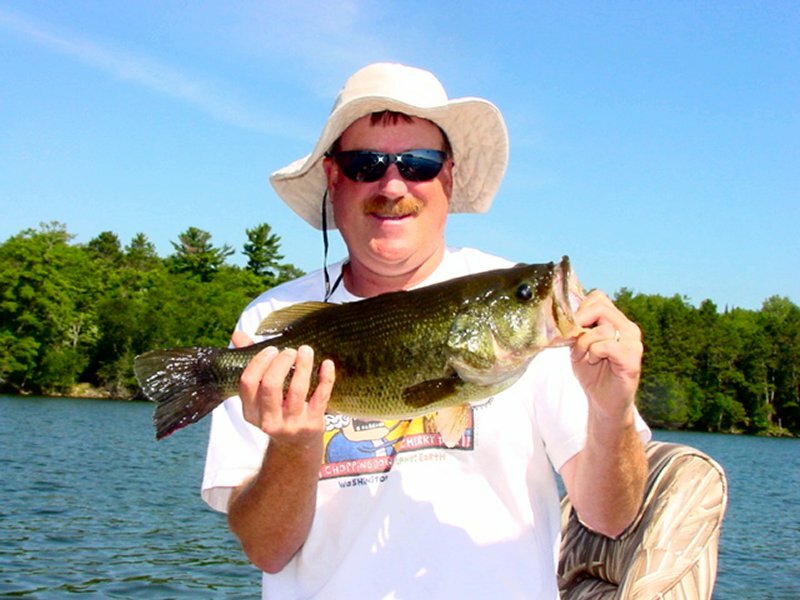 Weedline action has also been improving for the Bass and panfish that we love to catch during mid summer. We’ve had some excellent mixed bag fishing on the deeper weed edges, especially where we can find rocks mixed with or adjacent to the weedline. Some of this rock/weed mixed structure will be holding 5 or 6 species of fish at the same time. 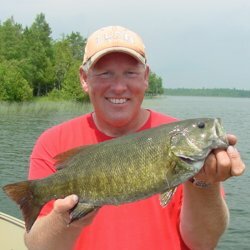 On a recent trip we caught Smallmouth, Walleye, Pike, Largemouth, Crappie, Bluegill and Rock Bass all on the same spot. I really like to start fishing these areas with a jig and plastic worm. A simple 1/8-ounce jig and a black or purple 6-inch plastic worm will work great as a starter or "search bait". Once you figure out what kind of fish a weedline is holding you can refine your presentation to better suit the fish you locate. If you continue to catch Bass, stick with the soft plastics and experiment until you find ones you really like. 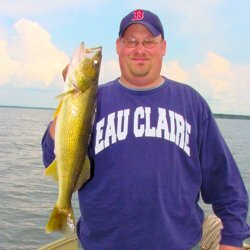 If you find Crappies, you might want to switch to smaller jig/minnow or jig/soft plastic baits, Walleyes? Try fishing smaller jigs with night crawlers or leeches. You get the idea, match your bait to the fish and cash in on whatever opportunity presents itself. Perch fishing for me this summer has been hit or miss, with a lot more misses than hits. Even though there have been some fairly reliable spots on a small number of lakes, there is no real widespread action bite that I can report on. The best approach I can find is to fish the secondary drop off areas where shoreline flats meet with the deeper water of the main lake. In other words not the shallow drop off areas that you’d find in 5 to 8 feet, but the areas where water drops from 12 to 18, maybe a bit shallower or deeper depending on the lake you’re fishing. Cruising along this secondary drop off area with a spinner/minnow combination is a good way to find the Perch. When you find a better school, they will frequently be on a small patch of gravel or rock located on these flats. You can slow down and fish these areas with jig/minnow combinations as well. Larger Northern Pike continue to use open water where cooler temperatures and larger baitfish roam at or just above the lake’s thermocline. 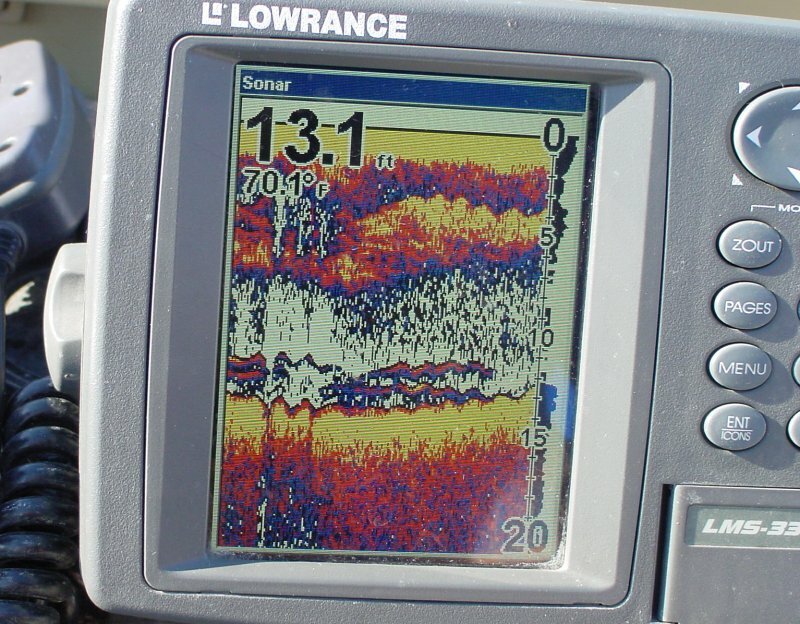 On several of the area lakes we’ve been able to recognize this thermocline setting up at 22 to 26 feet deep and when you watch your Lowrance, you can actually see the line where deeper cold water meets with the warmer surface water and creates a "barrier" called a thermocline. 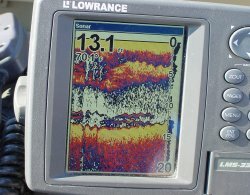 Most baitfish and game fish will hold at or just above this barrier and these fish are what you see represented on your Lowrance. Not all of the Grand Rapids area lakes have a thermocline, but when you find the ones that do, you can troll deeper diving crankbaits over open water to catch some of these larger Pike. Walleye and Musky if they’re present in your lake can also be caught with this open water trolling approach. A deep diving bait like the Salmo Perch or Deep Diving Shad Rap could be all you need. But if you find fish deeper than 20 feet, you’ll probably need to add some weight. The simplest way to do this is by adding a snap weight, bell sinker or even the rubber core type sinkers to your line a few feet ahead of the crankbait. Experiment with weights and keep track of how much line you let out by counting how many rod lengths of line you have out. If you start getting serious about the deep trolling, you can buy reels that keep track of the line with a counter. But for starting out, counting the rod lengths will get you in the ballpark. We’ve had some decent Crappie fishing this week and I’m optimistic about the prospects for the next week or two as well. Heavy cover is the secret during the day. On one Deer River area lake we found a nice school of Crappies using a heavy patch of coontail weeds mixed in a larger patch of Cabbage weeds for cover. On another, we’ve found them among brush piles. In either case, we’ve had to fish vertically (up and down) from an almost stationary position to catch them. If you’re fighting the wind, moving too fast or fishing too far above them, they will let you pass right on through without striking. Hold the boat still and get the bait in their face, then you’ll start catching some. For faster action, fish these areas at twilight with a slip bobber. Crappies are notorious for that "evening run" along and above the deep weeds. Bluegills aren’t too far from the same type of structures and to help catch more of them, switch to a jig with a cut piece of worm as bait. Fish closer to the bottom along the weed line and the Bluegills are active enough to find you. Once you locate a school, try moving in (shallower) and out until you fine-tune the location. Then stay close to that area and fish it thoroughly. A warming trend is gently pushing up surface temperatures and moving the summer feeding patterns into full swing. On Wednesday the surface temperature on Lake Winnibigosh was 73 degrees at mid day. Most of the Deer River and Grand Rapids area lakes are in that temperature range right now. Mayfly hatches that were heavy last week have noticeably declined in the past day or two and a shift from "Walleye or die" fishing to the mid summer mixed bag style fishing is slowly taking shape for me. Continued warming predicted for the next week should continue to push us in that direction. I wouldn’t be surprised to see excellent mixed bag opportunities developing. Perch that have been weed bound and illusive for the past few weeks are inching their way toward the open water structures that they use during mid summer. The softer bottom areas surrounding mid lake humps and bars have attracted some nice size Perch. Although they are in small numbers so far, the trend is moving us toward some good open water Perch fishing. Checking the smaller rock areas and deeper weeds, we’ve discovered that some Perch are moving toward areas where Crawfish are most abundant. Mixed sand and gravel with light weed cover are perfect locations and it looks like we’ll be into some action on those spots as well during the next week or two. 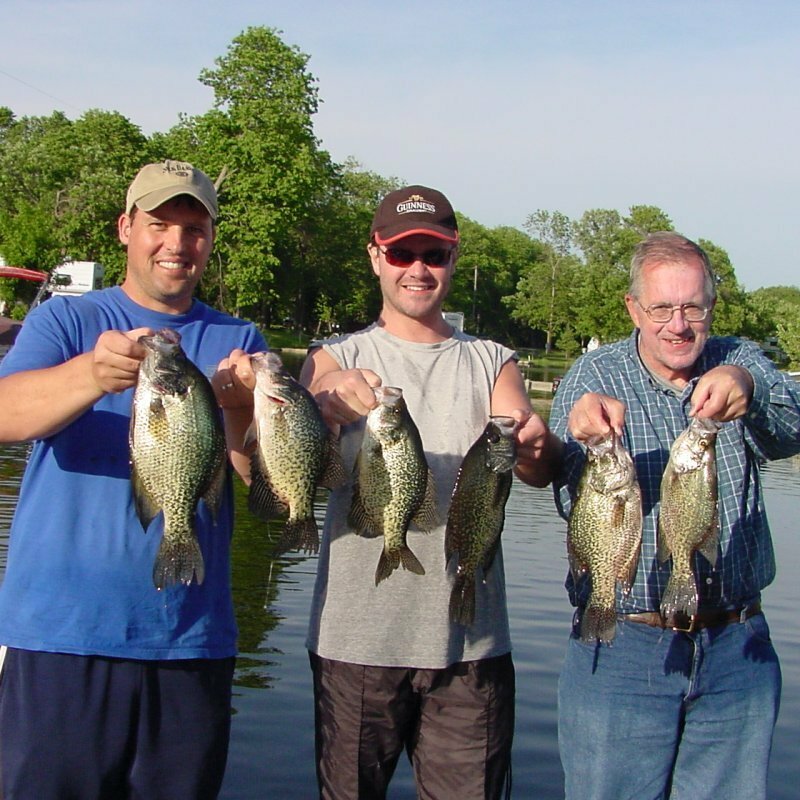 Click here for more about mid summer Perch fishing on Lake Winnie. Walleye fishing in the area is what I’d call "good" providing you’re adaptable and willing to work at it. They’re certainly not on an all out rampage, but sticking with the search and adapting to conditions as they develop will keep you in enough fish to make it interesting. Unchanged from last week, we’re still fishing mid lake humps and bars. The ratio of "keeper size" versus "slot size" fish has shifted noticeably toward the smaller keepers. We’re still releasing a larger portion of the "slot fish" but finding keepers has become easier this week. Walleyes inhabiting the weedlines are generally running smaller than the mid lake fish, but with minnow populations at seasonal highs, these fish are well fed too and it takes some searching to find a hungry school of fish. On the bright side, if you keep looking, you will find them and when you do they are more susceptible to jig and minnow or jig and worm style fishing that usually leads to some of the greatest Minnesota mixed bag fishing of the year. This is some of my favorite fishing because you can catch a variety of fish on the same baits, on the same weedline, on the same trip. Larger Northern Pike are in open water where cooler temperatures and a new supply of baitfish, mainly Tulibee are providing some excellent feeding opportunities for them. If you’re after some better than average Pike, tolling deeper running crankbaits like the Salmo Perch or deep running Shad Raps will get you into some action. Another good approach, try running a live bait rig with a 17 to 20 pound test monofilament leader, 2/0 hook and a seven to 10 inch minnow along the edges of main lake structure. Steeper edges along the breakline, areas with scattered rock and areas near weed flats are good places to start looking. Fish the rig just like you would use a Lindy Rig for Walleye. Substituting the larger minnows will help attract a higher percentage of Pike, but don’t be surprised if you catch a few nice Walleyes while you’re experimenting. The summer solstice has arrived and the classic mid summer Walleye fishing patterns are in full play right now. Cooler weather and lots of windy days have brought surface temperatures back down into the high sixty to low seventy degree range and a re-birth of the weedline bite has really charged up the action on a handful of the Grand Rapids area lakes. Most Walleye fishermen in the area (including me) have really focused on the deeper, main lake structures for the past couple of weeks and those deeper structures are still producing very well. In fact, if you’re trophy hunting and enjoy the classic deep structure fishing with live bait rigs, I’d suggest sticking with that pattern for a while. If you like the "action bite" and prefer shallow jigging the weedline, the wind and cooler weather have brewed up a pretty darn good shallow fish opportunity. We’ve found that the best action centers around loosely grouped cabbage weeds on shallower flats. Six to eight feet of water has been a key depth range. I’ve had to work to locate any areas where the weeds are mixed with either gravel or light rock/sand and when I find this type of structure, we’ve found smaller Walleye (eater size) of 13 to 15 inches in larger numbers. Depending on what else is available in the lake, we’ve also found plenty of Northern Pike, Bass and panfish in these same weedlines. Two presentations have produced best. First, a 1/16 ounce "Sneaky Pete" fished with a smaller size Rainbow Chubb and second, a live bait "Lindy Rig" substituting a 1/16 to 1/8 ounce bullet sinker for the traditional slip weight. Leeches or crawlers can be used on the live bait rigs, but I think crawlers are currently out performing leeches on the lakes I’ve fished. This live bait rig fishes the weeds fairly well especially when the fish are willing to roam out to the edges. Move slowly along the weed edges with your electric trolling motor and work the jigs by casting up into the weeds, then working slowly back toward the boat. The rigs can be fished just outside the deeper edges. When you find a school of fish, re-run the area once or maybe twice, then move on to find "new" fish. Largemouth Bass, Crappie and Bluegills have begun to show up in these deeper patches of Cabbage and in some of the Coontail patches along the outer edges. We’ve literally stumbled on to these fish while we work the weed edges for Walleye, so if you’re flexible, you can get into some of the mid-summer mixed bag fishing right now. If we find a school of Bass on these outer edges, switching to a 1/8-ounce jig and plastic worm combo produces great action. Bluegill nip at the tail of the plastics and you can zero in on them by switching to a small jig and cut piece of worm. If you hit a school of Crappies, try the same small jig, but substitute a 1-1/2 inch tube or small twister tail. Cast these into the weeds and fish them with a slow pumping action. If you fish lakes with brush piles, cribs or other heavy Crappie structure, you’ll be able to find some fish in these locations as well. Another early summer pattern that most folks can master easily is to anchor along the deeper weed edges during the evening and fish with slip bobbers until dark. The panfish go on a feeding binge at this time and small jigs tipped with minnows (for Crappies) or a cut piece of worm (for Sunfish) will get you in on some good action. Larger Northern Pike have mainly moved out deeper. But this same shallow weed structure will produce some fish of decent "eating size" along with lots of smaller Pike, particularly on the jig and minnow combo. For more information, click this link to a recent article about Pike fishing that sheds some light on utilizing these smaller Pike for eating. Perch fishing can be good at times, but there are a lot of days when the Perch seem to have vanished. My best guess is that the super abundant baitfish supply is keeping the Perch well fed, satisfied and scattered. Only when you find an active school, will they really bite well and since they’ve been scattered, we’ve had to struggle to keep locating small groups of fish. 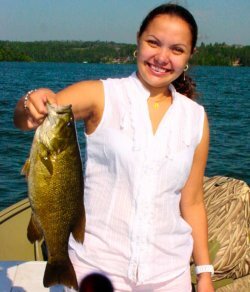 Bass, like this Smallmouth are locating on the deeper points and weed edges. This fish hit a jig & Crawler during the search for Walleyes. Nice bonus! Small jigs like these 1/16 ounce Sneaky Pete's are great for fishing the weeds. Short hooks and streamlined body make them less prone to snagging. 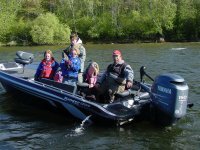 June fishing trips are in high demand in Northern Minnesota and it’s shaping up to be just the kind of weather for fishing that most folks hope for. Mid seventy to lower eighty-degree air temperatures, combined with stable weather and ideal water temperatures have made this a very nice week of fishing. For anglers that are Walleye fishing in the Grand Rapids region, the pursuit has become more centered on deep fish that have moved out to main lake structures. Walleyes of every size are showing up in larger numbers each day to take advantage of the insect hatches, minnows and larger baitfish. Tulibees, Suckers and Whitefish will all attract larger fish while young perch, shiners and other minnows attract the smaller ones. This has been good news for those folks fishing lakes with protected slot size limits, because for a time, only the larger fish were present on main lake humps, reefs and bars. Now these structures have a reasonable number of keeper size fish along with an opportunity to catch a very nice "picture fish" or maybe even a trophy. Live bait rigging has become more important every day and even though we can still catch some nice fish on a jig and minnow combination, the rigs tipped with either night crawlers or leeches are the best performers. Rig length? 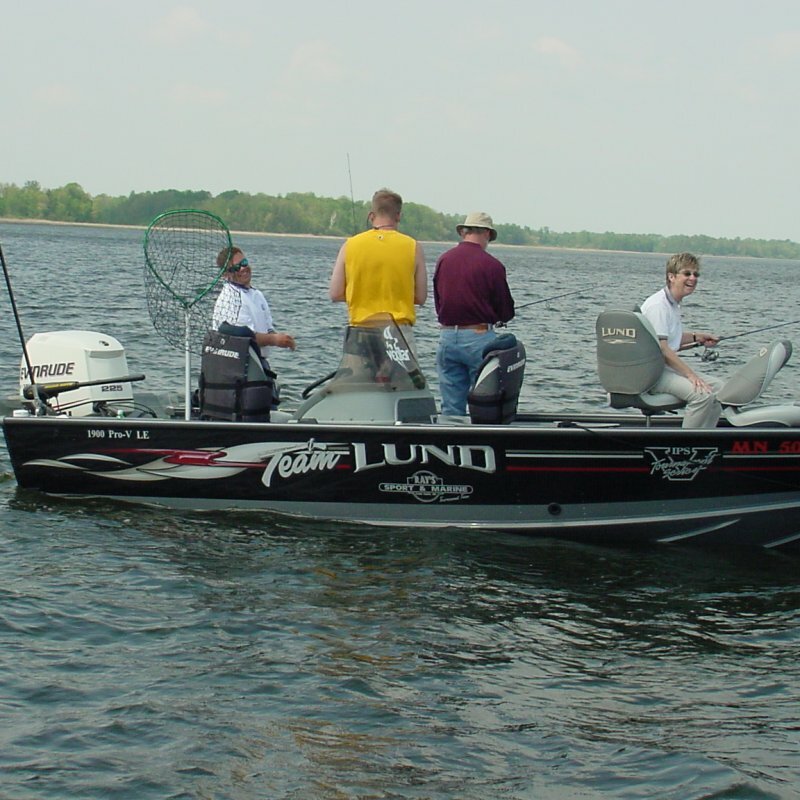 For fishing lakes like Winnibigosh, Bowstring, Sand and others in our area, I like rigs that are 5 to 6 feet in length and tied on 6-pound monofilament line. I like colored hooks, but I have had plenty of great fishing with the plain hooks as well and I think it’s fun to experiment until you find a combination that gives you confidence. So, try ‘em all until you get the color, length and performance that you believe in. That’s what really makes it work, mind over matter. 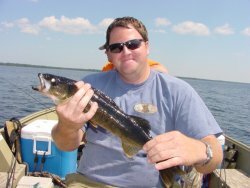 A tip about the size of Leeches for Walleye fishing has been that the "Super Magnum Jumbo Leeches" are working fairly well for larger fish. 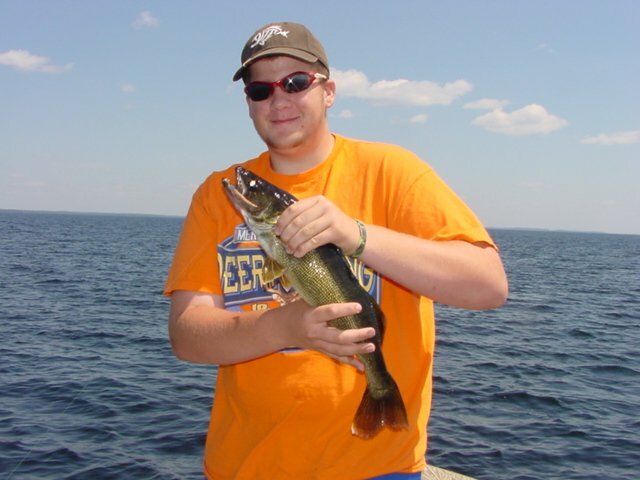 But if you’re looking for an average size "keeper Walleye", large or even some of the better medium leeches will get you more bites and a higher percentage of eaters. Crappie and Bluegills have begun to show up in the deeper patches of Cabbage, Coontail and along the pouter edges of the deeper Bulrush patches. Most of the spawning fish have wrapped it up for this summer and are staged out in these deeper locations. If you fish lakes with brush piles, cribs or other heavy Crappie structure, you’ll be able to find some fish in these locations as well. One early summer pattern that most folks can master easily is to anchor along the deeper weed edges during the evening and fish with slip bobbers until dark. The panfish go on a feeding binge at this time and small jigs tipped with minnows (for Crappies) or a cut piece of worm (for Sunfish) will get you in on some good action. Northern Pike have moved toward deeper structure as well and the larger fish are using structure with handy access to their preferred food choices. Lakes with good Tulibee populations will generally have better size Pike locating on steep drop off edges. Pike will also eat Crappies, Suckers, Whitefish and even other smaller Pike. So any structures with good weed or rock cover that’s located near deeper water will produce some fish. If you like to troll, try using the deeper diving crankbaits along the edges of main lake bars. Bass fishing in shallow cover like Bulrushes is still good. Smallmouth are moving along sandy breaklines and rocky areas in water depths of 5 to 8 feet. Some of the surface baits are still producing well, but if you’re like me and like to fish with jigs and small plastic baits like crawfish, twisters and plastic worms, your time is here to get active. Perch fishing on Big Winnie has been a little tough for the past couple of weeks. The good news is that they’re starting to show up a bit more each day. Better numbers and better size fish are being located in weeds located on the shallower flats. Concentrate on depths of 5 to 8 feet of water and when you locate weeds that have rocks or gravel mixed in, hover in that area and fish vertically and slowly. For some reason, Perch have been more active on calm days so when you see the lake turn to glass, head to the flats. Walleye like the ones shown in the picture above are cashing in one of the better feeding opportunities. A huge school of Shiner minnows hovering within eyesight just under the surface. In clear water, you can watch the minnows and occasionally even spot the Walleyes as the roam the weed edges. You can compete with all of that bait, but you have to keep searching for an active school of fish. Trying a variety of baits and locations will eventually pay off. Summer storms like the one that pounded hard on most of Northern Minnesota last Monday are usually to blame for a slow down in fishing and this was no exception. A day after the storm past, we were trying hard to locate active fish to keep the pace active. But this time the effect of the storm passing through was less dramatic than usual. I think it’s because it helped to counter-act the unusually hot weather and warm water temperatures that we’ve had so far. On Monday, I was able to find afternoon surface water temperatures of over 75 degrees. On Tuesday the surface temperatures were back down below 70 degrees and after a sluggish morning, the fishing had already begun to return to a normal pace for this time of year. Walleye fishing has probably been most affected by the enormous populations of baitfish in area lakes. Bumper crops of baitfish such as young Perch, Shiners and other minnows have made feeding easy for hungry Walleyes. Add to that the increasing number of areas where Mayflies and other insects are beginning to hatch and the result has been feast or famine fishing for many folks. The fish literally have it so easy right now that they don’t have to move to locate all the food they need. If your timing is off, or if you give up the search before you find an active school, some lakes could seem like the Dead Sea. The good news for Walleye fisherman is that if you find the right school of fish at the right time, the Walleyes are actually aggressive and easy to catch. In addition, there are a variety of approaches that will produce fish right now and it’s likely that your favorite methods will produce at least enough to keep you busy at times when fish are active. During the past couple of days, jig and minnow combinations, live bait rigs with night crawlers or leeches, spinner rigs, crankbaits and slip bobbers are all producing fish. The secret has been finding fish and then experimenting until you break the code of catching fish from that particular school of fish. Crappie and Bluegills are in the shallows right now and are in full spawning mode as the warmer water draws them in. Look for fish in water depths of 6 inches to about 4 feet, maybe a little deeper. Panfish are actively building beds right now and slowly moving along shoreline looking for the small "scooped out" areas will reveal where the fish have been active. If you have problems locating the fish during daylight hours, come back at evening and try these areas as the sun goes down. Presentation is a small jig 1/16 or 1/32 ounce, help up with a small bobber. Tip the jig with minnows for Crappie and use a cut piece of worm for bluegills. If you have ultra light equipment, you can cast small tubes, twister tails or feathered jigs without live bait. This more aggressive approach is perfect for locating fish while you are moving along a shoreline and want to check for signs of activity in the area. Northern Pike continue to inhabit the shallow weedline areas and the small hammer handle size fish are so active right now, that it’s hard to get your bait down to other fish in the area. Larger Pike are showing up in the deeper water along sharp drops, rock bars and on deeper weed flats. If I had to pick one presentation that would be most useful right now, I’d go with live bait rigs, a 2/0 hook and larger minnows like a Sucker, Creek Chubb or Redtail. Troll the baits along steep breaklines to 14 to 22 feet of water. Bass fishing is still largely centered on the shallow water spawning beds and most Bass fisherman are using spinnerbaits, jerk worms like the Sluggo or small minnow type stick baits like the Salmo or Rapala. Sight fishing around shallow bulrushes, mixed rocks and gravel or even around boat docks is working well. 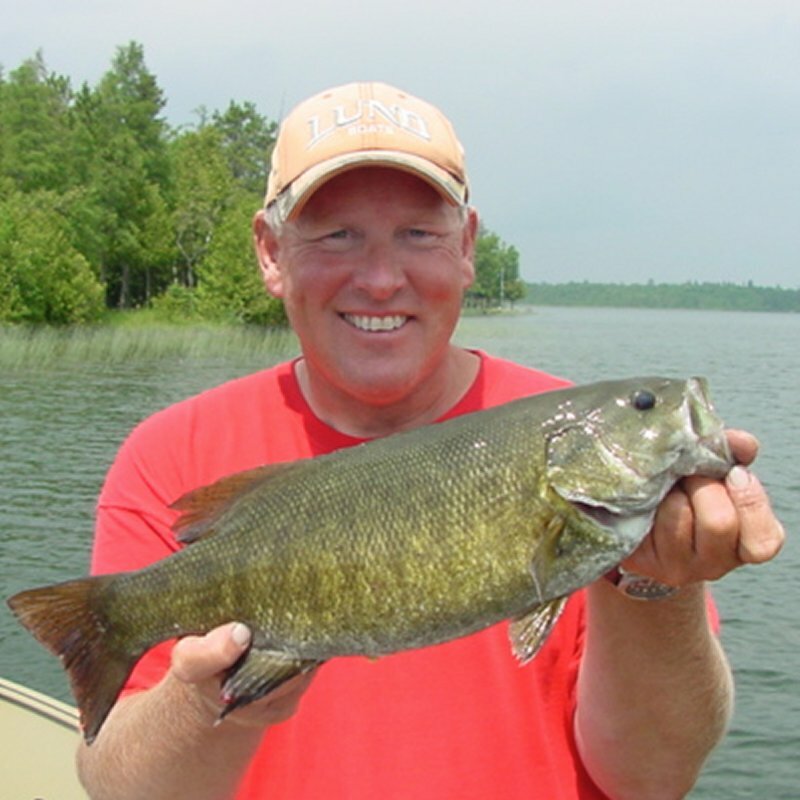 For the time being, Smallmouth will be found in the rockier sections of shoreline, Largemouth tend to favor the weedier sections. Areas that contain both types of shallow cover will produce a mixed bag including some panfish. If you were tired of cold, rainy Memorial Day weekends, then this was the one for you. In the past few days, surface temperatures have dramatically increased, moving from the high fifties a week ago, into the upper sixties now. On the other hand, July-like weather has been moving the fish out into open water sooner than usual and it’s been tricky for lots of folks to figure out just where to fish as they discover the favorite fishin’ holes from the past have already been temporarily vacated. Walleyes are still available in good numbers in shallow water, but the feeding fish are following schools of baitfish that continue to spawn and they are moving a lot. A hot bite today, won’t necessarily guarantee that the school of fish will be in the same spot tomorrow. When fishing the shallows, your best bet is to move frequently and go shallower as warming water draws baitfish toward the shoreline. 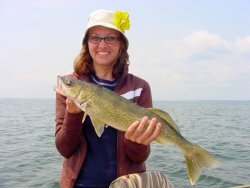 During windy periods, shallow water Walleyes will become more active and it pays to fish the windy shorelines right now. Jig and minnow fishing continues to be the fastest way to catch fish, but your presentation needs to be more aggressive than it was a week ago. Hard snapping, and faster hopping of the jig will trigger more bites than the slower, drag and drop that worked well in colder water. There are already a good number of Walleyes moving to deep water, with the shoreline related bars, deep weeds and sharp drop off areas showing the first signs of life. Presentations are varied, live bait rigs with Leeches are producing, so are heavier jigs (¼ to 3/8 ounce) tipped with minnows. Open water humps and bars further out into main lake areas aren’t producing much yet. Watch for those areas to produce well in another week to ten days. Crappie and Bluegills are in the shallows right now and are in full spawning mode as the warmer water draws them in. Look for fish in water depths of 6 inches to about 4 feet, maybe a little deeper. Panfish are actively building beds right now and slowly moving along shoreline looking for the small "scooped out" areas will reveal where the fish have been active. If you have problems locating the fish during daylight hours, come back at evening and try these areas as the sun goes down. 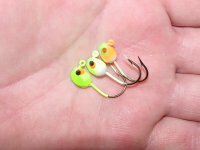 Presentation is a small jig 1/16 or 1/32 ounce, help up with a small bobber. Tip the jig with minnows for Crappie and use a cut piece of worm for bluegills. If you have ultra light equipment, you can cast small tubes, twister tails or feathered jigs without live bait. This more aggressive approach is perfect for locating fish while you are moving along a shoreline and want to check for signs of activity in the area. Bass season opened this weekend and as you might expect, Bass are moving in the shallows as they spawn in many of the same areas that we’re seeing the Bluegills. Surface presentations are the ticket right now. Small minnow baits spinnerbaits and surface lures like the Chug Bug will produce some nice fish. A note about fishing shallow water during the spawning season. I apologize for getting on the soapbox, but when we fish the shallows during the spring spawning season, it’s important to minimize our impact on the fishery. Bass should be returned to the water as close to their spawning bed as possible. Panfish can easily be over harvested right now, so keep a few for a meal and return the rest to fight again another day. During spawning, Crappies that appear "Blacker" are likely to be male fish. Keep those and return the ones that appear "normal" or more silvery in color as these are more likely to be females. If you practice selective harvest, you can literally have your cake and eat it too. Walleyes are still active in the shallows. Warm weather has lots of folks smiling. 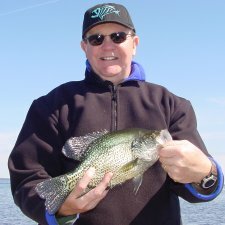 Warm surface temperatures are drawing Crappie, Bass and Bluegill into the shallow water to spawn. The weather during the first full week of the open water Walleye fishing season has been a challenge for Minnesota anglers. Surface water temperatures hovering in the mid to low fifties are actually losing ground as cold night temps dipping into the thirties coupled with low daytime high temperatures and blustery North winds offer little relief. Walleye fishing for most folks has been much better during the warmer afternoon hours and if you plan to visit the lake this week, I’d suggest sleeping in and hitting the water around noon. While there have been a couple of days where morning fishing was good, the afternoon bite has held up to be as good or even better on most days. Presentations are, as you’d expect, lightweight jigs of 1-16 or 1-8 ounce tipped with Shiners, Rainbow Chubs or nice Fatheads are producing the best action. Live bait rigs with leeches or night crawlers are working for some folks, but are a distant second in terms of action. Jigging action is really important now, so it’s important to vary your approach. At times, aggressive jigging, hopping or snapping has turned fish on. At other times, we’ve found that a simple steady wiggling or twitching of the rod tip triggered fish better. In really shallow water where sand grass has been a problem, we’ve set a slip bobber for about 18 inches off the bottom and used a slightly heavier jig while drifting with reasonably good success. Walleye location is still primarily shoreline structure like shallow drop-offs, weedbeds and shallow rocks. There are also some schools of fish to be found on the deeper water breakline in water depths of 22 to 30 feet adjacent to shoreline structures. These deeper fish are trickier to trigger, but we’ve done all right with a 1-4 ounce jig fished vertically. It’s been a good strategy to fish the shallows first, then move out deeper to clean up some of these scattered schools of deeper fish. If you’re fishing on some of the smaller, deeper lakes try the outer edges of weed beds about two to four feet deeper than the weedline. Aggressive Northern Pike are using the weed cover and make Walleye fishing really tough. But the clean-lip areas just before the drop off breaks into deeper water. 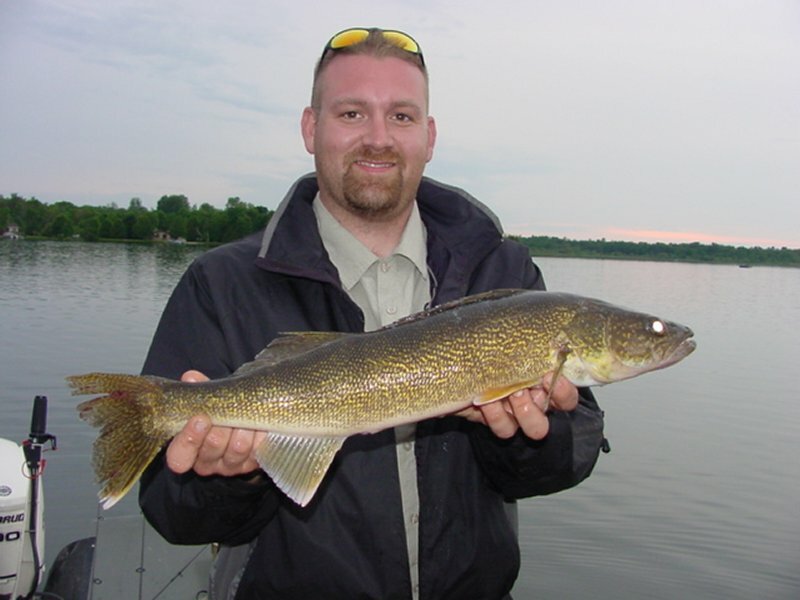 These areas are holding Walleye in fair numbers. You might find that there are several small schools spread out along an extensive drop off, so be patient and keep moving. We’ve discovered some really aggressive Perch during the past few days. Both size and numbers are very good! Key locations have been shallow weeds, especially Cabbage in 5 to 8 feet of water. There are some early insect hatches going on and the Perch we’re catching are virtually full of these insect larvae. This is usually a pattern that continues for a while, so it could be a great time to get the kids packed up to gather the makings of a great fish fry. Crappies are in the midst of their spawning run right now. Male Crappie are sporting their Black spawning color and female Crappie are plump with eggs. Cold nights force the fish out of the shallows, but warm sunny afternoons trigger a move back in to the structures where they’re doing the best they can to establish spawning beds. Pick and choose your days and you’ll be able to get in on some action. The predicted warming trend should help and I’d guess that Crappie action will peak in the next week to 10 days, especially if the water temps can reach back up into the lower 60 degree range. 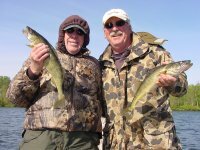 The 2006 Father & Son Walleye fishing trip at Bowen Lodge was a big hit this year. Lots of wind and cold weather gave the group a test. 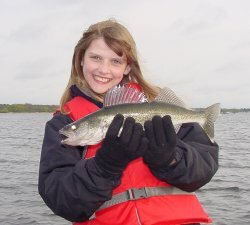 But the kids (and the dads) came through with flying colors and bagged plenty of Walleye on Lake Winnie. 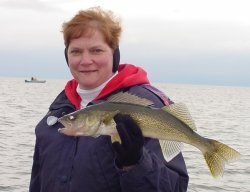 Cold weather hasn't stopped the Walleye fishing. Bundle up and keep fishing until you find them. 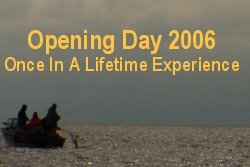 The 2006 Walleye fishing opener has finally arrived and for me, it was a once in a lifetime experience. It's been 22 years since I actually fished with my own wife on opening day, so using the re-opening of Red Lake and the Mothers Day weekend as an excuse, I opted not to take a charter this weekend. Instead we packed up the whole family including my mother and headed to Washkish where we made a family event out of welcoming back the Red Lake Walleyes. I doubt that it could have worked out any better. After a disappointing start, sitting out the first half of the day hoping for a break from the rain, we finally saw a little break on the radar screen and made a mad dash for the lake in mid-afternoon. Our first pleasant surprises were the terrific new boat ramps and expanded parking areas located on both sides of the bridge. 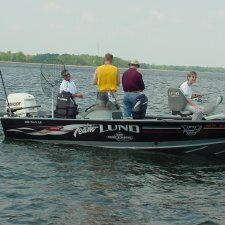 I talked with DNR officials who said that the traffic was heavy, but below expectations and the available parking had been sufficient to handle the fishing opener traffic throughout the day. We found that getting on the water and finding a parking spot was easy and within 20 minutes or so, we were on the water making ready to fish. We fished the area to the Northwest of Washkish and concentrated mainly on the shallow breakline from 4 to 7 feet of water. 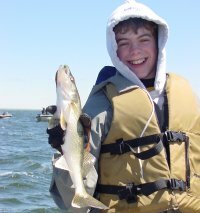 As expected, the Walleye were cooperative and widely distributed. We found many loosely grouped packs of fish and there were several stretches where action would start and stop as we moved through the small schools. Even though we did locate several better than average groups of fish, we opted to just keep on moving along the break with the MinnKota rather than trying to stay with any particular school of fish. These scattered groups of fish were really a blessing because it split the crowd up into many small groups and managing to fish around the traffic was very easy and pleasant. We fished strictly with jigs & minnows and used 1/16 and 1/8 ounce jigs tipped with shiners. For us, colors weren't particularly important, but we did have one hot fisher-girl who was using a 1/16 ounce bug eyed shorty in the glow-pink combination and this particular color did work a bit better than most others we tried. We also saw folks catching plenty fish using slip bobbers as well and a few of them were picking up some Crappies, but not in large numbers. We had expected a little more Crappie action because of reports from friends earlier in the week, but the dropping water temperature (51 degrees) from all of the recent rain and cool weather must have temporarily sent the majority of those fish back out into the main lake. 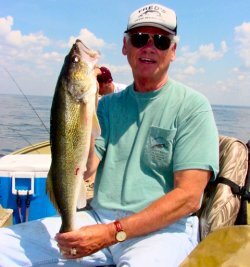 Coping with the protected slot size of 17 to 26 inches for Walleye was no particular problem, but I would estimate that we returned about 4 slot fish, for every keeper size fish (under 17 inches). 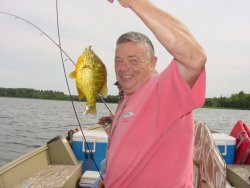 That said, we were still easily able to each keep two fish for a fish fry and the Canadian style regulation does have some potential to eventually become more widely accepted among Minnesota anglers. There's no doubt that the DNR is serious about enforcing the regulation though as we were greeted by DNR when we arrived at the landing and again when we left. They were passing out flyers explaining the regulations, taking creel assessment surveys and checking anglers for licenses, safety gear and fish limits. If you head up to Red Lake, have your ducks in a row and plan on getting checked at least once, maybe more. To me, this was a historic day for Minnesota anglers and I think one has to give a lot of credit to the folks who have helped bring about the recovery of the Walleye fishery in this great lake. It's clear that the effort hasn't been wasted and all in all the DNR, Red Lake Tribal Officials and sportsmen's groups have worked pretty darn well together during this process and the result is going to benefit everyone who has a stake in seeing that the fishery continues to prosper. After an 8 year ban on Walleye fishing, Red Lake is open again. 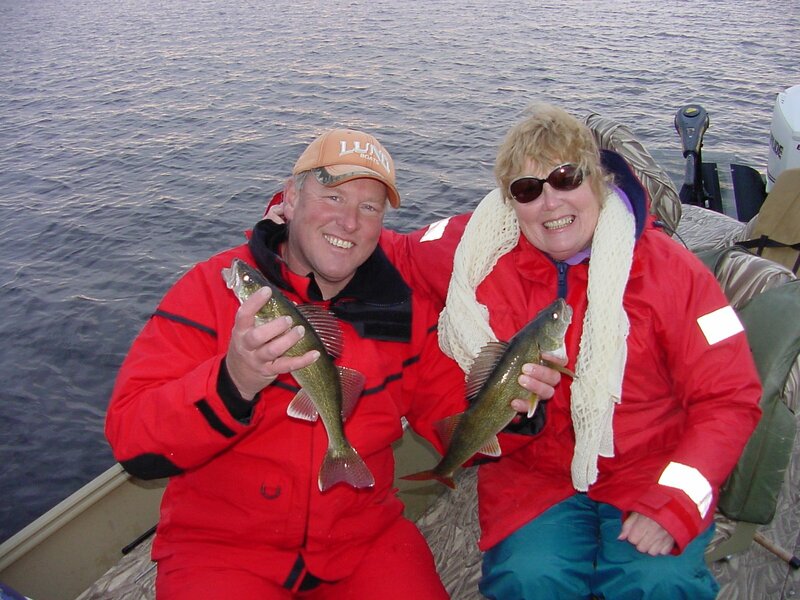 Anglers who visited Red Lake on the 2006 opener were rewarded with calm seas, light traffic and cooperating Walleyes. How can you beat a day like this with the family?